Looks fun, whatever he's doing there! News Gal wrote: Looks fun, whatever he's doing there! ROTFLOL, like the Infinite Cat Project? Definitely his own . When you look at his art, you'll see he has no need of tracing . Excellent picture! I like the camera angle. I'm assuming that you were joking when you asked if he traced. That would be funny, wouldn't it. Importing images is always fun though, playing with them even more so. The following interview combines two telephone conversations recorded from Los Angeles on May 7, and May 12, 2007. The drawings by Leonard Cohen were included in an exhibition called “Drawn to Words: Visual works from 40 years” that premiered at the Drabinsky Gallery in Toronto on June 3, 2007. 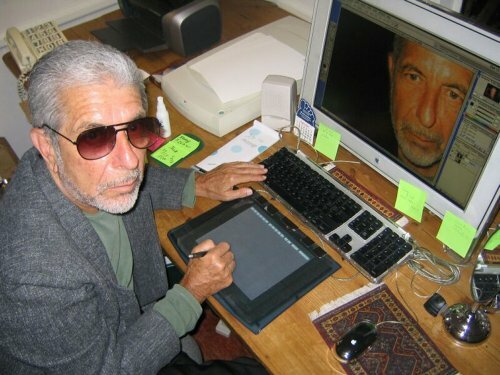 LEONARD COHEN: The proofs were printed by Graham Nash who has a state-of-the-art printing facility on the beach. I think we printed 56. Quite a few, which are in colour, aren’t in the Book of Longing. A number of the images in the book were details of larger works in which the colours are very rich and the blacks very black. The medium for the drawings ranges from watercolours to oil pastels, to a number of combinations of those, which are then put in Photoshop. A lot of them were drawn on a Wacom tablet with a free-standing stylus fit right into the computer. So it really runs from doodles on napkins to watercolours, oil pastels, charcoal drawings, right up to digitally created images. BORDER CROSSINGS: So you go from doodles to an image that you consciously sit down to orchestrate. Does that cover the way the work comes to you? LC: Well, you know, just as play is deadly serious for children, so doodles are deadly serious for me. BC: My question wasn’t about forming a hierarchy as much as the way the Muse comes to you. I’m interested in the relationship that exists in your mind between the drawing and your work as a poet, songwriter and novelist. Do they come from the same source? LC: I think one is relief from the other. I always drew and when my kids were growing up a large feature of our family activity was to sit around the kitchen table with a lot of different kinds of material and draw. That’s always been what I’ve done, especially in Greece when there seemed to be a lot of time, or when the kids were growing up in Montreal. Then I got interested in computers. I don’t know if you remember, but at a certain point Macintosh gave free computers to Canadian writers, including Margaret Atwood, Irving Layton, and Jack McClelland. Not only that, they were kind enough to provide tutors who actually came to my house and helped me set up and showed me how to work it. So I got interested in the Macintosh computer quite early. Cool insight on the issue, DrH thanks! Thanks for finding this pic News Gal! I was wondering myself about those pieces that look computer-generated and the tablet does look like the answer. Hey there Bright! I found it on the Leonard Cohen Files, under Cohen & Internet. I'd love a tablet like that, lots of fun stuff with Photoshop and other programs would be useful there. News Gal wrote: Hey there Bright! I found it on the Leonard Cohen Files, under Cohen & Internet. I'd love a tablet like that, lots of fun stuff with Photoshop and other programs would be useful there. Thanks. Yet another corner of the Leonard Cohen Files that I have not explored. Jarkko's site is so vast, it's almost depressing. brightnow wrote: Yet another corner of the Leonard Cohen Files that I have not explored. So right Avi - it's hard enough just keeping up with new posts! Edit - But always, thank you Jarkko and moderators for the fantastic jobs you do! No kidding! I leave for a while and the additions are incredible - it becomes too much! At one time I could keep up, but no longer. This is a library, a scholarly place while still being social. Such a vast and comprehensive site. ! Yowza! That's one of Lorca's photos for http://www.dearheather.com - I think LC is designing Dear Heather CD, one of possible layouts. Around that time he was having the beard (as you can see both on him and his photo on the screen). In any case, he sent the bright new photo those day when it was published on site in Fall of 2004, so he was doing something 'round the CD I'd say. And he's quite sun-tanned - it was after the Summer.